I recently stumbled across a peculiar old map for the island of Montreal showing a rather fantastic depiction of the island’s former creeks and lakes. It’s unlike any other map of the island I’ve ever come across. There’s no publication date printed on it, but given its author, Aristide Beaugrand-Champagne, it likely dates from the 1920s. Beaugrand-Champagne was one of the city’s architects and historians. He was also the originator of the idea that Jacques Cartier first arrived in Montreal from the north via Riviere Des Prairies rather than the South. Though it had its share of proponents, it was, and still is a controversial theory. This point of Cartier’s landing is highlighted on his map along the north shore, in Sault Au Ricollet. During his studies, Beaugrand-Champagne paid special attention to the island’s former watercourses. In doing so, he came to the conclusion that the Iroquois village of Hochelaga was once situated in Outremont rather than in an area contained somewhere within the McGill University campus— another controversial theory for its time. Anyway, with that mini-history lesson is out of the way. Here’s Monsieur Beaugrand-Champagne’s pièce de résistance. Clicking on the map for the larger view is recommended for this one. Beaugrand-Champagne’s map illustrating the island’s topography and hydrology between 1542 and 1642. It’s hard to tell how much of this map is based on Beaugrand-Champagne’s knowledge of the island’s geography and how much of it is based on his imagination or even cultural bias. Any illustration attempting to show what the island looked like more than a couple of centuries ago is bound to have a certain degree of inaccuracy, and this one is no different. For a map intended to show what the island looked like during the 16th century, the large lakes at the eastern end of the island seem inconceivable. However, a surficial geology map from 1975 reveals these same areas to consist mostly of peat- a sign that, at the very least, there was once marshland there. One of these areas contains the recently developed complex of subdivisions named Anjou Sur La Lac. Of course, the “lac” that exists today are entirely artificial creations. Detail of map from 1975 illustrating the east island’s surface geology. 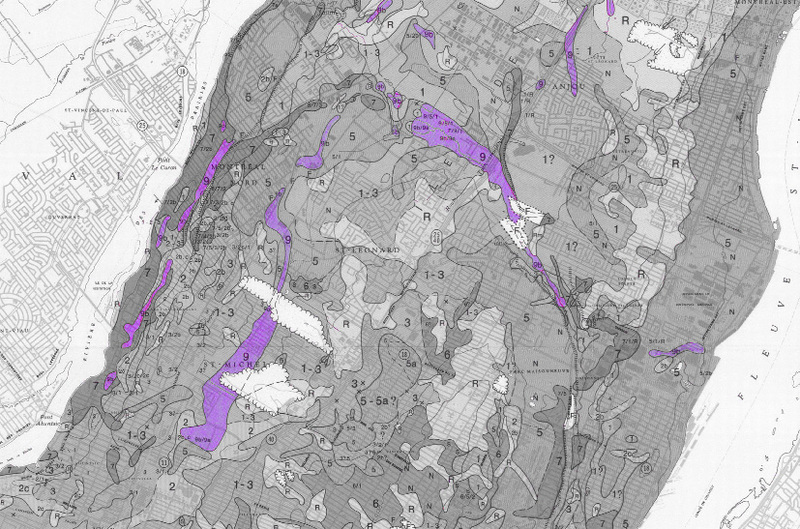 The areas highlighted in purple represent areas high in peat. While the depiction of former lakes and marshland might be accurate, the map isn’t without its flaws. Ruisseau Molson is mislabeled as Ruisseau Migeon which was actually situated further west. The general tangle of lines formed by some of the creeks bear no resemblance to either the earliest maps of the island from the 1700s or the more detailed cadastral plans that would start to show up a century later. The way each system conveniently connects to the next also seems a bit unnatural and makes it less than convincing. Besides Beaugrand-Champagne’s map, there’s little else out there that illustrates the island’s former hydrology. There are a couple of old maps that illustrate certain drainage boundaries, but there’s really only one other option out there if ever you want to know exactly what flowed where. Detail from the map entitled Les Ruisseux et Fosses published in 1955. 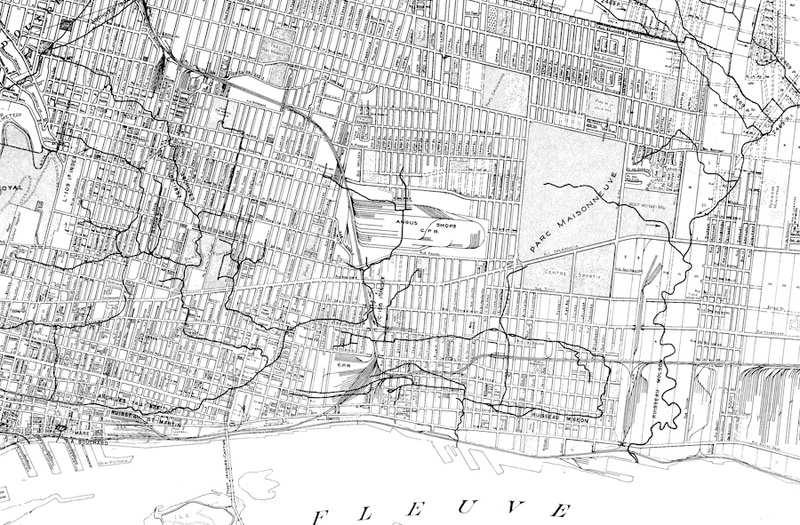 In 1955, Montreal’s Water and Sanitation department published a map entitled “Les Ruisseux et Fosses.” Despite its age, it’s what they’ll give you at the City’s Planning Department if ever you go in and ask for a map of Montreal’s creeks. These same paths show up as dotted lines on the city’s sewer maps, and I suspect it’s what developers will refer to when deciding where they should and shouldn’t build certain things. Not surprisingly, a lot of it contradicts other maps published over the past few centuries and its unclear what source some paths were based on. While a good deal of it does seem to be accurate, especially the areas surrounding downtown Montreal, some of it seems either too complex or not complex enough. Nevertheless, it’s the one I’ve chosen to use as foundation for my own interactive map. While I’m tempted to go through it and clean up a few things, it would be a difficult task to figure out just what should be changed. Take Ruisseau Glen, a small tributary of Riviere St. Pierre that once ran just east of the Turcot interchange. Given the number of variations of its path from map to map, it’s hard to know which one is the most accurate. Which one is it? 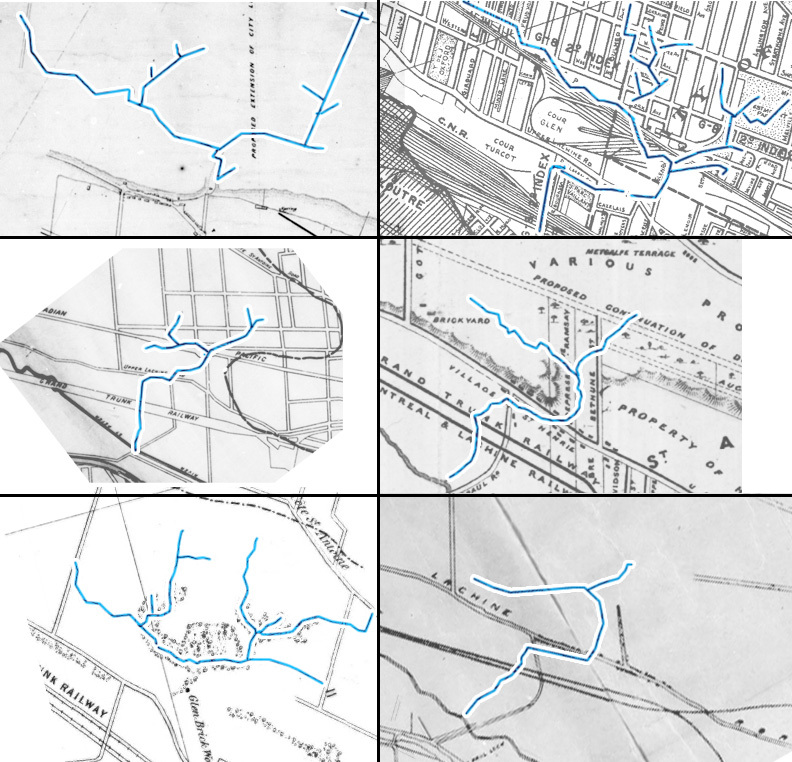 Variations of Ruisseau Glen’s path from multiple maps dating from the 1700s to 1956. Another problem with almost all of these maps (my own included) is that there’s no indication as to how wide these watercourses were and how much water actually flowed through them. One might assume that a line represents a creek when in reality it may have just been the smallest of springs. 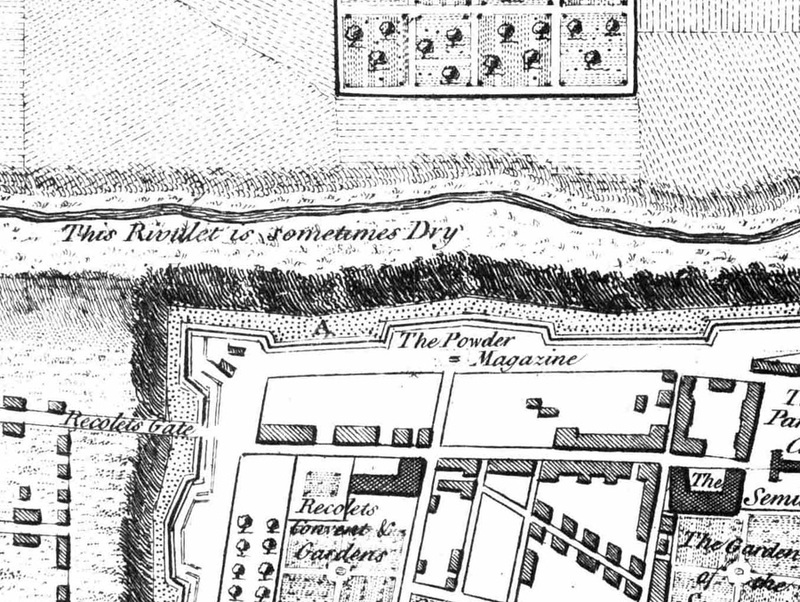 Even one of the city’s more famous lost “rivers”, Riviere St. Martin is shown on one map from the 1700s with “This Rivulet is sometimes dry” written below it. 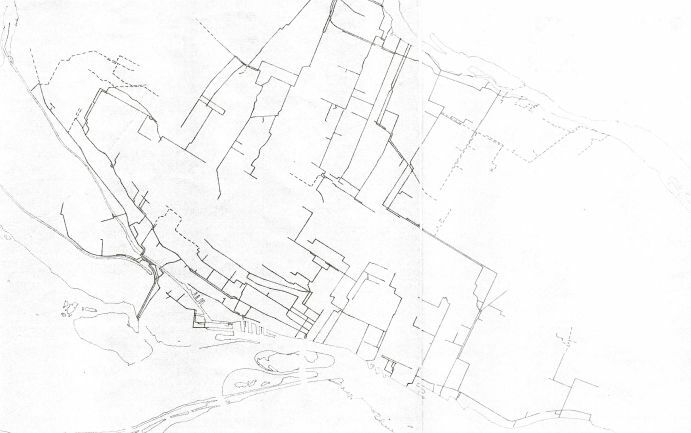 Detail of map from 1760 showing a portion of Riviere St-Martin flowing behind the original fortifications of Montreal. Whether its lack of water was caused by Montreal’s development or from natural causes is unknown. 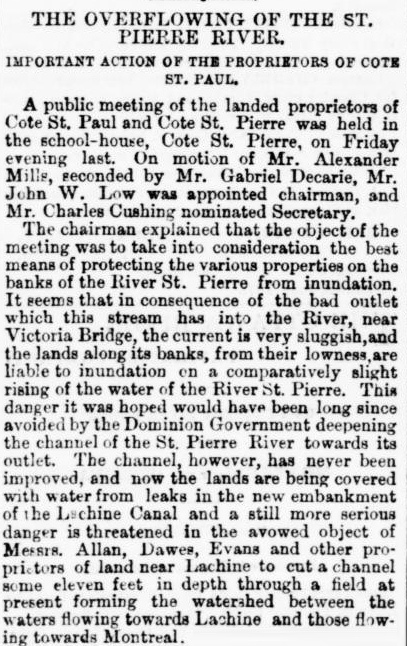 Similarly, Riviere St-Pierre, which by some accounts was quite broad at the points where it emptied into the St. Lawrence, was likely no larger than a small brook a short distance inland. A rare view of Montreal’s Rivière St. Pierre, 1956, location unknown. 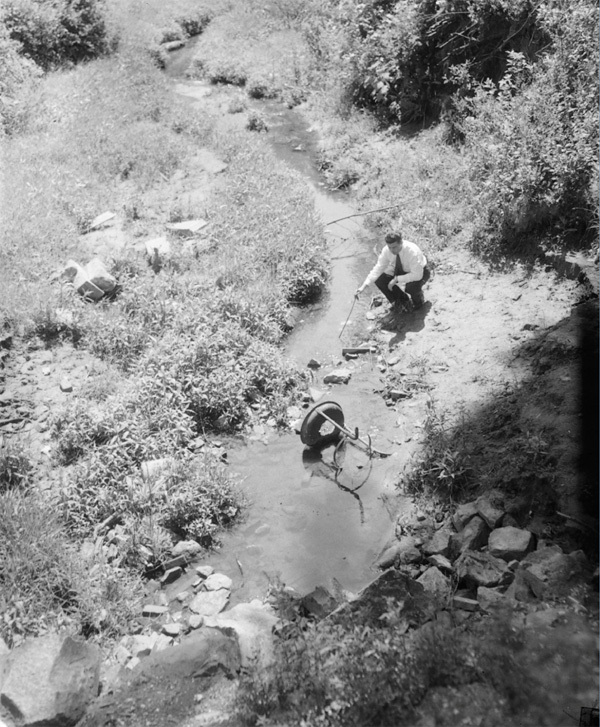 Even the portions that did appear to be deeper or wider were the result of human engineering as was the case in Verdun and Cote St. Paul where attempts were made to use the creek as an open tailrace for the city’s waterworks’ engines. Additional modifications were likely also made to prevent the sort of flooding recorded in an 1878 issue of The Montreal Daily Witness. Article from the Montreal Daily Witness, June 10th, 1878. Unfortunately, since much of the landscape where these watercourses once were has been leveled and built over, we don’t have much to go by. With but a few exceptions, we can no longer see the contour of the land where water once flowed. The natural vegetation surrounding them has been uprooted. With these visual clues scrubbed from the landscape, we can begin to look underground for clues, but it’s impossible to gauge how much of what flows through the sewers comes from the original network of creeks and how much is just wastewater. 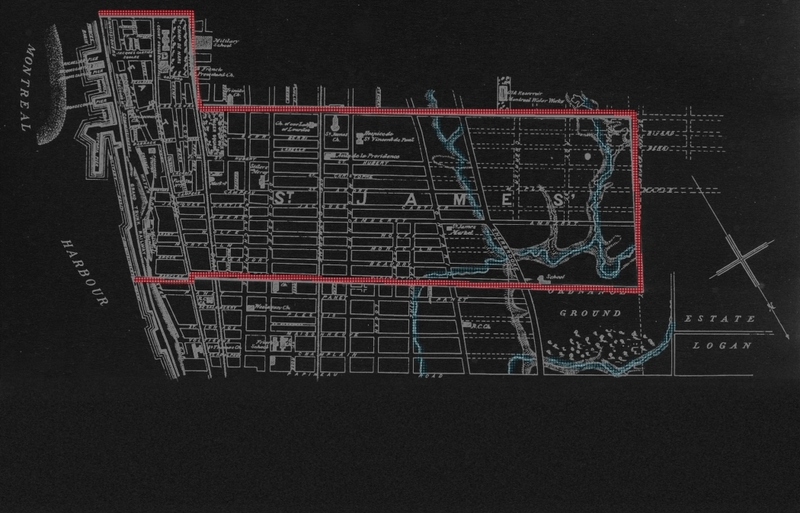 Depiction of the City of Montreal’s collector sewer system in 1962. By this point most of the creeks in this area of the island had disappeared. Instead we are left with a few (very few) photographs, written descriptions and a bit of oral history from those old enough to remember their remnants. These systems didn’t simply disappear when they were covered over, though. Instead, they just underwent a transformation. I’d like to think that my experiences and recollections of following these systems through the sewers are just as much a part of their open-ended history. Despite the fact that their paths now appear fixed and are easily traced, things will continue to change underground just as they did on the surface. Pipes will be enlarged, made smaller or set deeper into the ground. Old lines will be removed and others will be added elsewhere. New maps will be drawn, photos will be taken and hopefully over the course of this ongoing evolution, more stories will continue to be told. 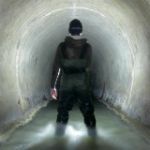 Since 2006, Andrew Emond has been exploring the underground systems of Montreal and Toronto, Canada. His interests lie in exploring urban areas less frequented by humans, and shedding light on their history, their value and their potential to spark our imagination. Excellent entry – it’s great being able to take a look back in time. Incredibly well written and so very intriguing. I am a fan. U are amazing. Keep on the good work. Great Article! I wonder if city hall will ever have the will and/or imagination to uncover some of these lost gems? I grew up on 29th avenue between St-Zotique and Belanger. This area was the site of homes built post WWII for returning veterans. In the early fifties there were 3 neighboring lots on this part of the street that remained vacant and at a much lower level (20 ft.?) than those built on (I have a couple of old pictures). It was as if massive amounts of landfill had been dumped on this part of 29th lots prior to the government’s housing development. Another largish area not far behind us fronting on 28th ave. was extremely swampy, providing a skating rink in winter and habitat of many frogs (their final refuge in this area). An old village nearby (25th/Beaubien) and 18th century manor house (Viau/Beaubien) suggest a good natural water supply. I have found a map that may be of interest to you. It is Gaspard-Joseph Chaussegros de Lery’s 1725 map of montreal, which incidentally shows the St-Martin flowing north of the city’s fortifications with a pond/lake to the northeast of the fortifications. I would not have found this if it were not for your blog. Thanks! Un article si bien écrit en effet; merci! J’apprécie le développement de la réalité géographique en parallèle aux doutes faisant presque office d’éducation méthodologique. Quelle maîtrise des sources documentaires, et quelle passion! Bravo. Amazing article, I am glad it worked out for you! Artist talk, TED-x Montreal, 2012. This site is devoted to documenting the ongoing evolution of underground spaces in Montreal, Canada as well as other cities. Areas of focus include combined sewers, storm drains, lost rivers and potable water infrastructure. Under Montreal welcomes any comments, questions and underground related anecdotes. Send anything else you care to share in the contact section. © 2006-2019 Andrew Emond / Under Montreal.